Being an elite partner of VMware, Vembu is focussed on reaching out to significant communities like VMUG and much more in order to ensure data protection for all VMware users. As a part of reaching out, Vembu will be a part of all VMUG events happening for the rest of the year. 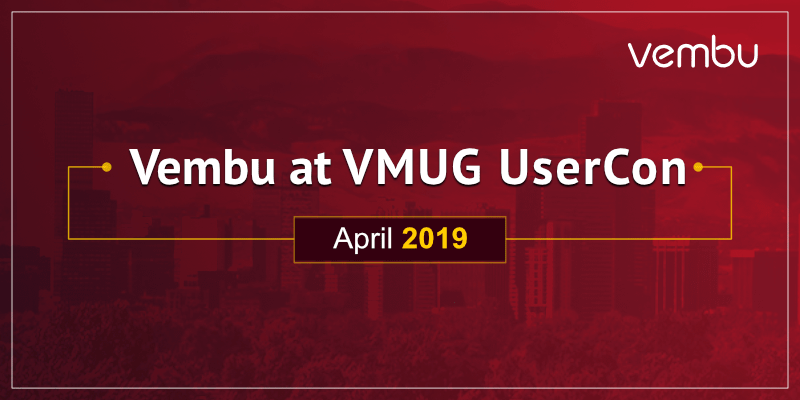 After a successful outing at VMUG UserCon Seattle, Vembu will be present at Denver on 9th April 2019, 16th April at Wisconsin, 18th April at St. Louis, 23rd April at Carolina, 25th April at South Florida. We are confident of meeting like-minded VMware administrators who believe in the digital transformation of the future. This would be a stage where techies of different backgrounds come together to discuss ever-changing trends in virtualization and how it would affect their business. Data Protection is usually the prime discussion in every major tech event as businesses are pretty much concerned about the data loss, more than ever. VMware is constantly making changes to its solutions to ensure that the integrity of data is not compromised. But even Small & Medium businesses have agreed that the presence of a backup solution is very much important for a sound Business Continuity Plan of any organization. Vembu would be showcasing their flagship offering, Vembu BDR Suite in all VMUG events happening in the month of April and we would like to extend an invitation to all VMware administrators who are concerned about the BC/DR of their organizations although we can touch base on other topics as well, which we believe will contribute to a better data-friendly future. Register for meeting us at VMUG Denver & other locations happening throughout the April month and get a chance to win exciting goodies as well apart from the insightful discussion that you might have with our experts. We look forward to meeting you in both VMUG and Roadshow events as we have something really interesting to share with. If you are unable to make it to the events, you would still want to try out our flagship offering, Vembu BDR Suite v4.0 using a 30-day free trial and book a meeting with our experts to discuss your data protection agenda. Product Analyst at Vembu Technologies. I define myself as goal-driven. Setting clear short & long term goals help me to stay focused.